The real freedom of any individual can always be measured by the amount of responsibility which he must assume for his own welfare and security. 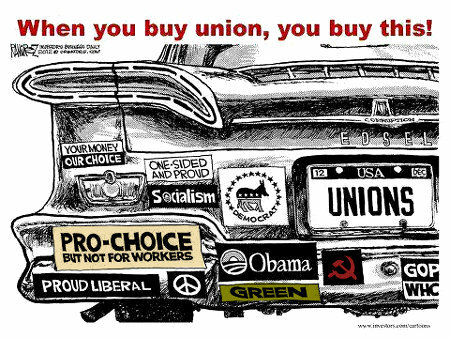 Whenever you buy union you buy all of what the “union provides.” Whenever you buy union you lend material aid and comfort to the union and to those individuals, groups, and agendas they support. Before you buy union consider what else your buying for yourself and your people as part of that package deal. This entry was posted on Tuesday, August 6th, 2013 at 8:10 am and is filed under Politics, Society. You can leave a response, or trackback from your own site.